Google Voice New Number Error... or Intended Blocking? For all of us getting a There was an error with your request. 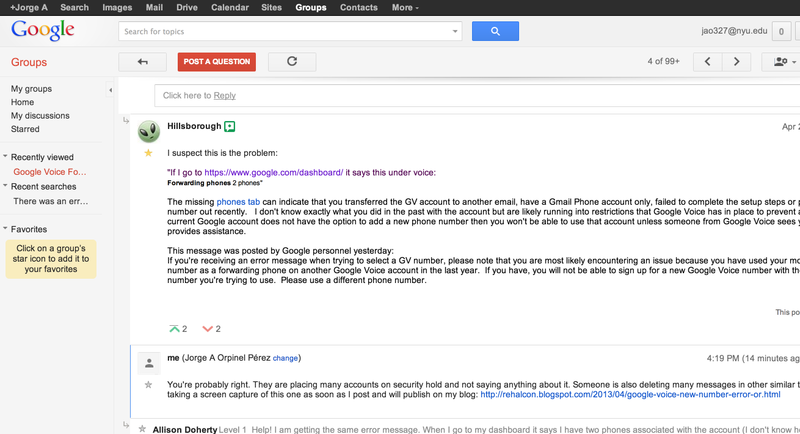 Please try again message when trying to obtain a new Google Voice number. I'm trying to get google voice set up, but I keep hitting the same error. I added my mobile phone number as the forwarding number, but then when I got to picking a new number from the list provided (int "Choose your number"), I got: "There was an error with your request. Please try again." I did some searches and found similar problems. I'm in the 48 states, so that's not it. People suggested going to the "phones" tab in settings, but that doesn't exist. Others suggested clicking the upgrade button, but that doesn't exist either. I do see "Get a Voice number" but that just leads me back to the error. Other problems people mentioned are that my phone is already used for another GV account and I need to change it. I don't think that's the problem, but I'm happy to try changing it to my landline for now, but I can't find an option that lets me do it. The first time I clicked "Get a Voice number" it let me setup a forwarding number, but now it skips right to "Choose your number" and the error. That would seem to be my problem, but I can't seem to get to a settings page that lets me delete, reset, or change those - or even see what they are. The missing phones tab can indicate that you transferred the GV account to another email, have a Gmail Phone account only, failed to complete the setup steps or ported the GV number out recently. I don't know exactly what you did in the past with the account but are likely running into restrictions that Google Voice has in place to prevent abuse. If your current Google account does not have the option to add a new phone number then you won't be able to use that account unless someone from Google Voice sees your post and provides assistance. If you're receiving an error message when trying to select a GV number, please note that you are most likely encountering an issue because you have used your mobile phone number as a forwarding phone on another Google Voice account in the last year. If you have, you will not be able to sign up for a new Google Voice number with the mobile number you're trying to use. Please use a different phone number. If you go to this search: http://productforums.google.com/forum/#!searchin/voice/There$20was$20an$20error$20with$20your$20request.$20Please$20try$20again./voice/v40PVH45G2M/46ARqzw5AUcJ you'll find all the other threads and no answers from Google. Yet many many deleted messages, including best answers. the problem is the forwarding number you entered has been used in the past and flagged. 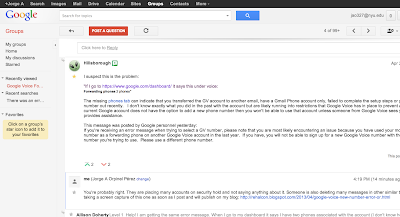 you cannot get a google voice number unless you delete your old forwarding # and enter a new forwarding number. Google makes it almost impossible to delete it however. I can help delete your old forwarding number so you can enter a new forwarding number allowing you to get a Google Voice #. the problem is the forwarding number you entered has been used in the past and flagged. you cannot get a google voice number unless you delete your old forwarding # and enter a new forwarding number. Google makes it almost impossible to delete it however. -- blocked comment by Thomas R.